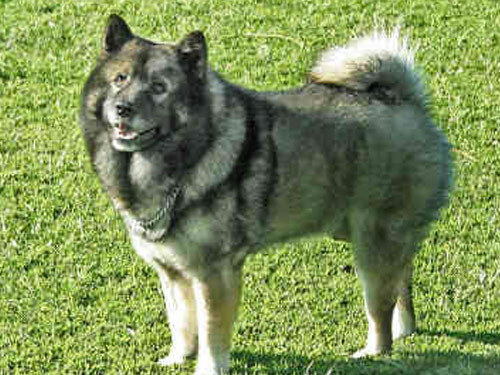 Originating in China, this versatile breed was utilied for herding, hunting, sledding, as as watchdogs. Chinese Foo Dog's are used as guardians of Buddhist temples and are considered sacred to the Buddhist religion. The Chinese Foo is the mascot of the oldest secret sect in the world known as the Tongs which believe the Chinese Foo brings good luck. An energetic, hardy, and bold breed, the Chinese Foo resembles the look of a lion. They are sturdy, compact, and squarely-built. They possess great dignity and exhibit a regal and dignified appearance. The Chinese Foo is not recommended for first time dog owners. This breed is friendly, devoted, and courageous. They are mild-mannered and docile, yet assertive when necessary. They are suspicious of strangers and will defend their family, property, and territory when threatened. Chinese Foo's are family oriented and thrive on attention and interaction. They do well with children, dogs, and other household pets they have been raised with. The Chinese Foo requires brushing on a regular and consistent basis. Bathing should be done when necessary. This breed has no known health issues. The Chinese Foo has a weather-resistant double coat. The outer coat is thick, off-standing, coarse, and straight. The under coat is soft and dense. The Chinese Foo is intelligent and quick to learn. Early socialization and obedience are required. This breed is often difficult to manage and is domineering. Chinese Foo's will not respond to harsh or heavy-handed methods. Training must be done with respect, firmness, fairness, and consistency. The Chinese Foo breed will do well in a city or apartment environment provided they are sufficiently exercised and mentally stimulated. They do best with a securely fenced yard or safe rural setting where they are able to play off-lead.